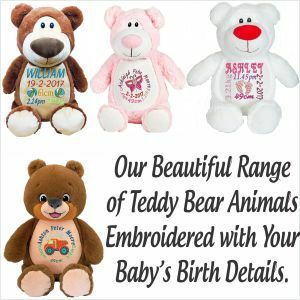 Personalised Baby Birth Details on a Teddy Bear or Stuffed Animal. 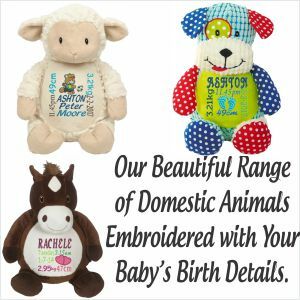 Remember the details of your baby's birth with a personalised Embroider Buddy or Cubby from Personalised Teddy Bears and Gifts. 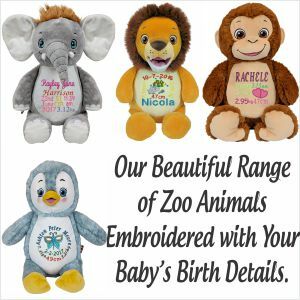 We personally create each design used based on the information provided by you at the time of order, and embroider every design onto your chosen animal, so that you can rest assured no two items will be identical. Select a base template and send us your details. We will modify the template to suit the animal and your data, to make a one-of-a-kind keepsake that will be treasured forever. 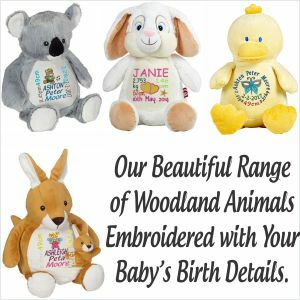 We can even embroider a message on the back of most teddies, so that as time goes by the true meaning of your gift will live on. We can also add words onto the feet of most animals. The design is only limited by your imagination. 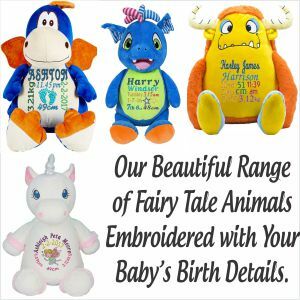 If there is something special you would like, write it in the comments section when ordering.